Sunday mornings at Church of the Apostles are centered around the Eucharist, a word meaning "thanksgiving." The order of worship for Holy Eucharist is twofold: we listen and respond to the Holy Scriptures, and we celebrate Holy Communion. Our liturgy follows the Book of Common Prayer, particularly the 1979 American Prayer Book, and the developing ACNA Texts for Common Prayer. Worship is not just the work of the musicians, the preacher, or the priest at the altar. It is the work of the whole congregation. For this reason, you will notice that our congregation is very active during worship. We sing, pray, speak aloud, sit, stand, kneel, and so on. Don't feel intimidated. Between the instructions in your bulletin and the instructions given by the priest and other worship leaders, you won't have any problem following along. When it comes time for Communion, we invite everyone to come forward. The ushers will help you find your place at the altar rail. Anyone who is a baptized Christian is welcome to receive Communion. The easiest way to receive is to hold out both hands, palms up, one inside the other. If you are not baptized or you do not wish to receive Communion, simply make an "X" over your chest by crossing your arms and you'll receive a blessing from the priest. The music for the 9a Eucharist is traditional: hymns from the Hymnal 1982 accompanied by an organ. The music for the 11.15a Eucharist is a bit more diverse. It includes some hymns accompanied by the organ, but also incorporates modern worship music accompanied by a contemporary band. 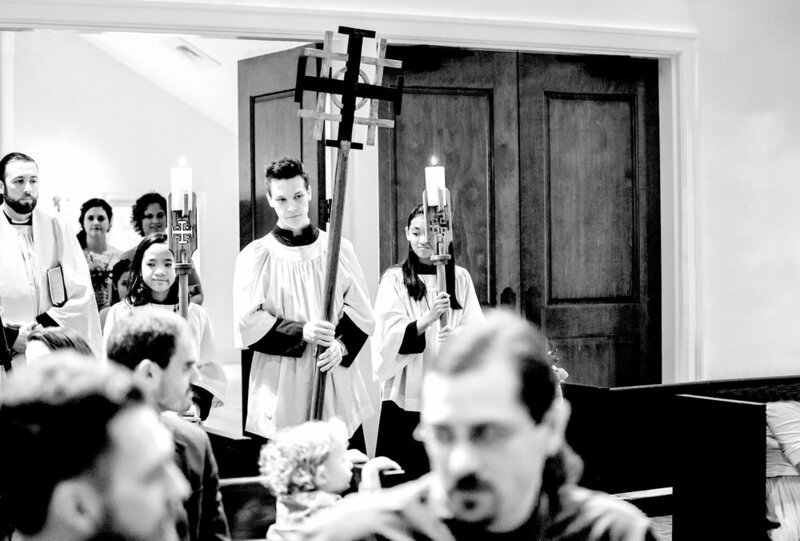 While our liturgy incorporates a wide range of musical styles, songs are always selected for the richness of their theology, the aesthetic of their music and poetry, and a prevailing emphasis on God. Song selection also reflects the scripture readings of the given Sunday as well as the themes and the posture of the liturgical season. Frankly, we don't have a dress code. From jeans and a tee shirt to a suit and tie, our parishioners dress diversely. Feel free to wear whatever you feel is comfortable and appropriate for worship. Nursery is available for infants and children up to 3 years. Children may be checked in before the service, and picked up before Communion to finish the service with their parents. Children from 4 years through 2nd grade can attend Children's Church, which gathers at the Gospel reading, meets downstairs during the sermon, and returns during the passing of the peace. We aim to worship God not only with all our hearts, but with all our minds as well. Between our two morning services, we have several options for Christian Education available at 10.15a. These classes are intended to help us grow in the faith, and to connect the Gospel with our lives. Classes are offered for all ages: nursery, K-2nd, 3rd-5th, Jr. High girls, Jr. High guys, High School, and adults. Directions can be found here. Before and after service there is a time of fellowship and refreshment in the Parish Hall. Visitor Parking is available in our parking lot off of Hampton Street. If our main lot is full, there is also parking available in the parking areas for the surrounding buildings, as well as street side parking. For a map of all the surrounding parking options, click here.